Celebrity chef and TV personality Siba Mtongana continues to rock the culinary world. As is the case with her international TV show, ‘Siba’s Table’, her recently released cookbook, My Table, has become an instant hit. My Table has taken South Africa by storm and has already made history as the best-selling cookbook ever to have been stocked by retail giant, Woolworths SA. Thus far it has sold over 33 percent more copies than any other cookbook Woolworths SA has ever carried. The self-published book, produced by her company, The Siba Co, has about 120 “Sibalicious” recipes for food lovers to try out at home. International fans can also soon expect to see My Table launched in the more than 130 countries in which her hit Food Network TV show, Siba’s Table, is aired. My Table is a perfect guide for food lovers and budding cooks who don’t have lots of time to spend in the kitchen. In her book, Siba, also known as the Queen of Convenience, shows you how to make dinner in no time and provides the kind of tips that’ll make something you whipped up in under an hour look like you’ve been slaving over the stove all day. “My recipes reflect my South African roots, international food trends and some of the exotic flavours and ideas that I’ve picked up on my travels around the world,” she declares. Siba’s ‘Local is Lekker’ section in My Table provides a personal take on an array of traditional South African favourites. Keeping up with the latest international technology trends, this cookbook also boasts QR codes that allow you to watch Siba making the recipes – a first for local cookbooks. My Table by Siba Mtongana is currently available at Woolworths retail stores nationwide, and retails at R490 per copy. Siba Mtongana is a passionate and dynamic food enthusiast who brought style and charisma to the South Africa television food scene. She is well known for her show ‘Siba’s Table’ on DStv’s Food Network, channel 175, which premiered in September 2013 and was an instant hit worldwide. It now broadcasts in more than 130 countries worldwide, including the UK, USA, Australia and many countries in Europe, the Middle East, Africa and Asia. 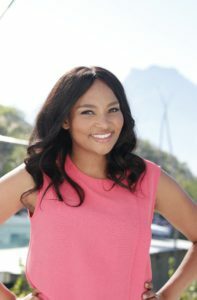 When her show made its début in the USA in April 2014, it made her the first South African TV personality to have their own TV show in America broadcast on the Cooking Channel – introducing Siba to more than 60 million homes in the USA alone. Siba is billed for a few international events this year, including one in Amsterdam and London next month. Locally, she will take part in several events, including this year’s Good Food and Wine Show, which will take place in Cape Town in May, Johannesburg in July and Durban in October, where she will appear as a headliner personality. She’s also preparing to film Season 3 of Siba’s Table later this year. *Catch Siba on new latest cooking show on SIBA’S TABLE SEASON 2 on DStv Food Network Channel 175.